Galactic Drax: My torso is open to show I'm not afraid of death. My shoulders are huge to show I'm awesome. Iron Man: Armor is supposed to keep you from dying. 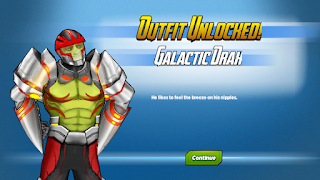 Galactic Drax: I thought armor was just supposed to make you look cool. Iron Man: Yeah, you're right. That's more important. Galactic Drax: Behold my flaming shoulders! Ghost Rider: Call me when your head is on fire. Galactic Star-Lord: We got sort of matching suits! Galactic Drax: Mine is for battle. Galactic Star-Lord: So is mine. Galactic Drax: You just got done dancing. Galactic Star-Lord: It was a dance battle. Galactic Drax: Did you see me out there?! Rocket Raccoon: I wish I didn't. 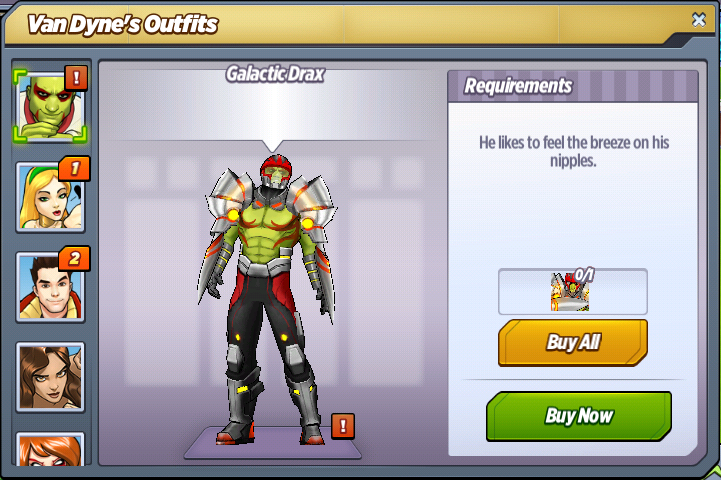 Galactic Drax: You don't like my new armor? Rocket Raccoon: I don't like you or your armor. 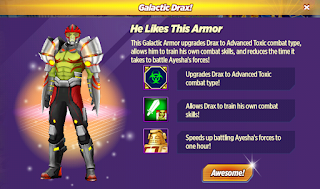 Galactic Drax: I need more knives to go with these spiked arms! Rocket Raccoon: That's the smartest thing you've said...ever. Galactic Drax: This galactic armor is making me a genius! Falcon: Man, if I see a guy your size flying, I'm gonna go the other way. Galactic Drax: The armor doesn't fly. The flames are just for show. Falcon: Seems like kind of a waste. Galactic Drax: It makes it easier for me to read at night. Ayesha: You're not the first to think high-tech armor will give you a leg up on me. Galactic Drax: I'm honestly not that flexible. Galactic Drax: Eyes up here, golden woman. Ayesha: I'm just deciding where to strike a fatal heart punch. What do you think of Galactic Drax? Were you able to get him?